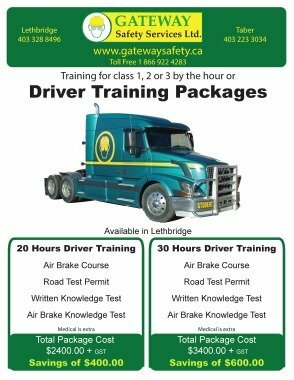 Gateway Safety Services provides a variety of training courses for general and job-specific applications. Below are the basic courses that we offer on a weekly schedule. Train The Trainer for most of our courses is available. Please note that the prices do not include GST. If you require specialized training that is not listed below, or if you want more information about our programs, please contact our office. Gateway Safety Services offers custom courses for your business needs. If there is a course you are looking for and it is not listed, contact us! Purpose: Basic training for personnel to determine cause(s) of an accident so that they may prevent further accidents. Class 1 and 2 require a driver medical test. Medical costs vary; use your doctor or ours. Class 3 does not require a medical test. These prices vary depending on the registry used. When calling, if you want to use our registry we can define the price. Call for more information 403-328-8496 or 1-866-922- 4283. Purpose: Provide rig workers with an understanding of the basic principles of fall protection. Purpose: Is to introduce students to basic rescue equipment, procedures, techniques, perform various rescues in a controlled environment and stimulate the students ability to reason in any emergency situation. Purpose: Basic training for personnel to assess a worksite and identify existing or potential hazards before work begins. Purpose: To understand the requirements needed to be in compliance with the regulations; Provincial, Federal and US. Purpose: Basic training for personnel whose job requires them to operate or use machine/item of equipment that is under lockout or tagout or work in an area where servicing or maintenance is done. Participants with an Alberta Operator’s License who receive 80% or better on the written exam are eligible for a reduction of up to 3 demerit points from their driving record. Unsuccessful candidates will be required to take the full course at their cost. Find out when our courses are happening.